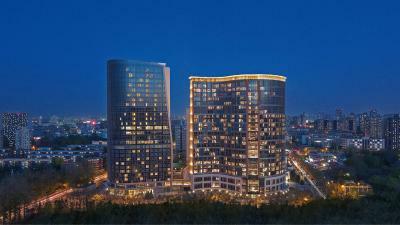 Lock in a great price for NUO Hotel Beijing – rated 9.1 by recent guests! The room was a nice size and designed to match the cultural surroundings. The entire hotel was immaculate. The staff was accommodating and attentive. If you go there introduce yourself to the Guest Services Manager , Frank Fang. He made my stay there exceptional. Gorgeous hotel. Nice, spacious and comfy rooms. Wonderful staff (front desk managers are amazing!). Great value. When open, beautiful swimming pool and nice sauna. Beautiful restaurants, tea house. 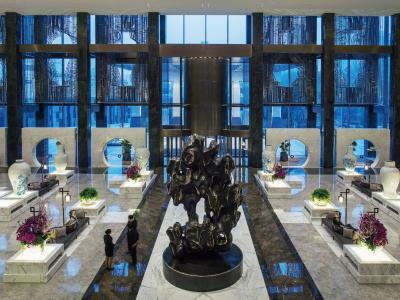 Close to airport and Wangjing district. This was an absolutely beautiful hotel - stunning decor! We booked the most basic room available - and it was over the top. Traveling with my daughter, we had 2 twin beds - but the beds were much larger than typical twin beds - and very comfortable. Every comfort amenity you could need was there - they've thought of everything. We stayed here to be close to the 798 Art Zone - which was a short walk away and didn't disappoint. The atmosphere and decor was top notch. Buffet and Room service were great. I have stayed in a lot of 5 Star hotels in the world... this is now in my top two! Magnificently designed hotel! Everything detail has been carefully considered! Truly outstanding. Room spacious with a great bathroom. Great espresso machine included with the room and use of a Bose Speaker was an advantage. Executive lounge was spacious with a variety of refreshments available. Booked an executive room, room is very nice and stylish. Everything in good condition. Staff is friendly. Executive lounge is also nice with afternoon tea options and evening snacks & drinks. We really enjoyed our stay. 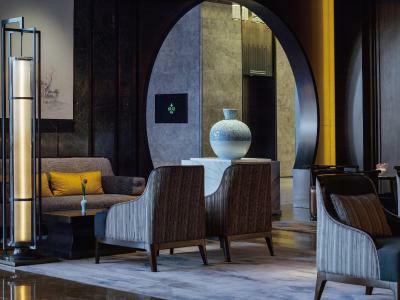 Close to the chic hub of 798 Art District, NUO Hotel Beijing is a treasure trove of countless artworks and is positioned 15 minutes' walk away from Jiangtai Subway Station (Line 14). 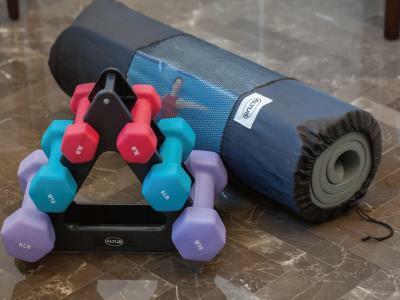 The hotel has a spa center, ballrooms, gallery space and fitness center, and guests can enjoy a meal at the restaurant. NUO Hotel Beijing is close to Beijing’s 798 Art Zone and the Wangjing Business District. 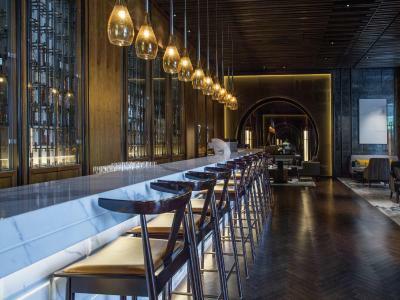 For a drink at the buzzing Sanlitun Bar street, it takes only 20 minutes by car. 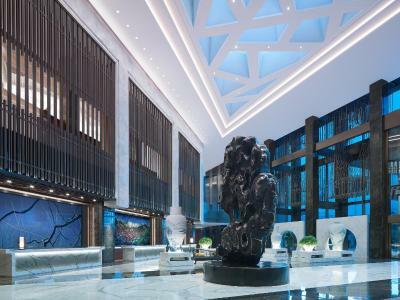 Within 35 minutes' drive, you may access both Beijing South Railway Station and Beijing West Railway Station. It takes 35 minutes by car to Beijing Capital International Airport. 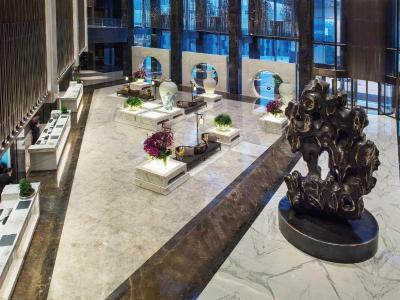 Designed with the touches of Ming Dynasty, the rooms and suites combine technology, art and a commitment to green efficiency. 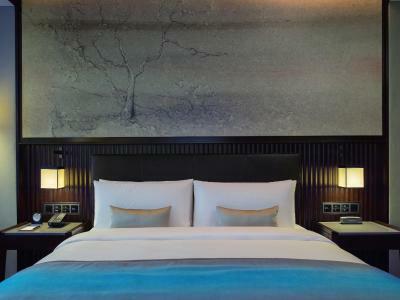 Furnished in calming blue, white and dark brown, all rooms come with traditional lanterns and paintings. Certain rooms feature a private bathroom with a hot tub, while others have bathrobes and slippers alongside with a walk-in shower. Some rooms have a seating area to relax in after a busy day. 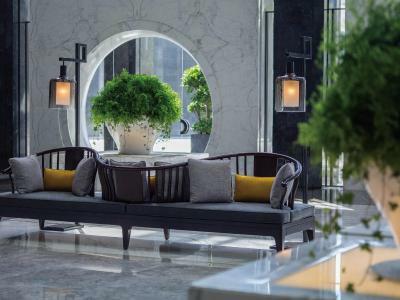 To rest after a long journey, guests may enjoy fragrant tea in the tea house or try a spa treatment in the spa center where tasteful art pieces by famed artists are showcased. The hotel also offers bike and car rental services for guests to sense the charm of this old city. The indoor swimming pool and the garden are possible places to unwind yourselves. 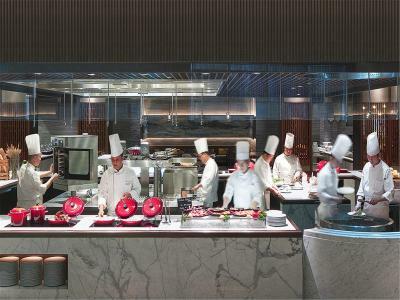 NUO Hotel Beijing’s six dining options will meet various needs, including all-day dining restaurant N' Joy and Jia Chinese restaurant. There is also room service offered. 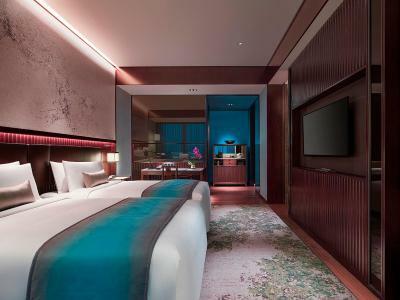 When would you like to stay at NUO Hotel Beijing? 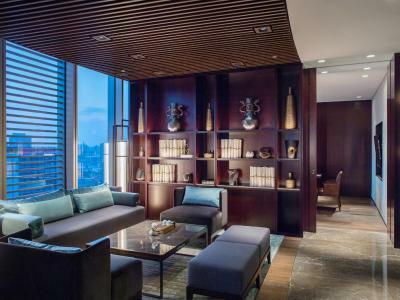 Located on the upper floors, the room has floor-to-ceiling windows, Ming-styled seating area and an executive writing desk. The bathroom features a bathtub with views across the city. Public parking is available on site (reservation is not needed) and costs CNY 6 per hour. 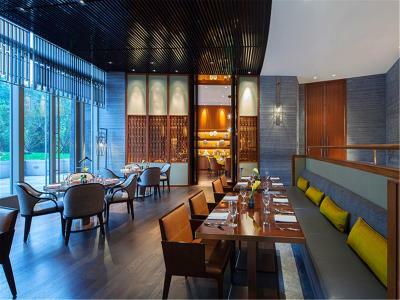 The room has floor-to-ceiling windows, Ming-styled seating area and an executive writing desk. The bathroom features a bathtub with views across the city. Room offers access to Executive Club Lounge. 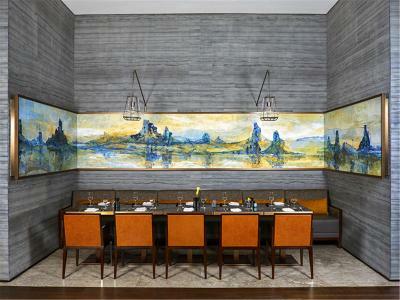 The room has floor-to-ceiling windows, Ming-styled seating area and an executive writing desk. The bathroom features a bathtub with views across the city. Featuring a spacious Ming-styled seating and entertaining area embraced by floor-to-ceiling windows, the room has a bathroom with a bathtub with views across the city. This twin/double room has a seating area, sofa and air conditioning. 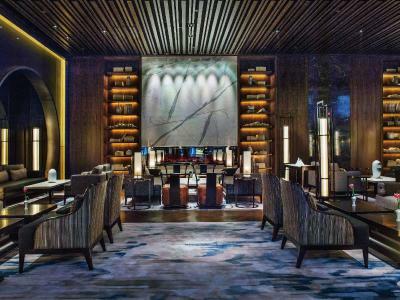 House Rules NUO Hotel Beijing takes special requests – add in the next step! All children under 12 years are charged CNY 466.40 per night for extra beds. Any additional older children or adults are charged CNY 466.40 per night for extra beds. 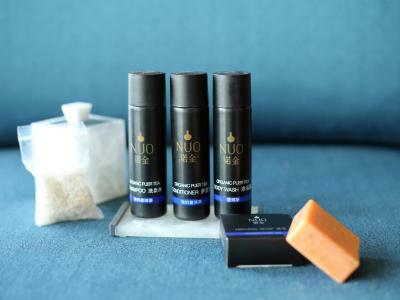 NUO Hotel Beijing accepts these cards and reserves the right to temporarily hold an amount prior to arrival. Please note that the extra charges for breakfast does not include tax and service charge. Dessert types are not diverse enough in the coffee shop, only cheesecakes are available. 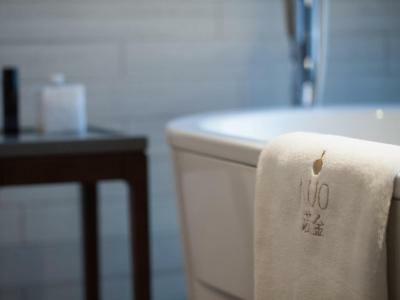 Stable Wi-Fi (very important for business travellers); Spacious bathroom with bathtub and shower place; Chinese tea ceremony set and tea leaves freely provided in the room. I would only say that possibly the steam room could have been kept a little bit cleaner. Absolutely everything, from the staff to the buffet food. The hotel was extremely comfortable and created a relaxed vibe for customers. Staff, including managers went out of their way to ensure guests were happy and looked after. Personal touches in the room were kind and thoughtful. Also when booking a staycation the checkout time was 4pm giving you a great deal of time to relax, unwind and enjoy all of the hotels resources. I shall definitely be staying again and highly recommend this hotel to others above other hotels in Beijing. There is everything to like about this hotel and nothing to dislike. The staff goes above and beyond in being helpful. Best hotel I’ve ever stayed in. Overall the interior design are very well done and thought through. Small details are attended to and finished workmanship are highly remarkable. Best Hotel in the world for many different reasons. Absolutely Perfect! The massage treatments took far longer than I was led to believe they would. Four hours in the spa might be some people's idea of heaven but, by the time it was finished, all the restaurants had closed and it was too late to eat. The pedicure girl made an impolite comment, so I cancelled that procedure. The bed was big and comfy. I liked the electric curtains and mesh curtains. The kettle looked like a real tea pot, made of china. The rainforest shower was amazing. I paid extra for breakfast and I couldn't do it justice, because there was so much on offer. Hotel is one of the best in the world and a class of his own. We stayed in a club room. The dim sum in the evening was very cold and when we pointed it out they brought the lights down onto the dim sum which were not turned on before and the chef came out to look and check but he just glared at us. We felt uncomfortable and I had liked the warm dim sums the night before!The dim sums remained cold for the evening. They were also serving stale sandwiches that were left over from the afternoon tea. We were quite disappointed with that considering the quality of the hotel overall. The bedding was amaaazing!!! The staff in the executive lounge were very attentive and hospitable and quick to refill glasses. They made us feel at home. Pool wasn’t working though it was supposed to be fixed by the time we stay there. Beautiful Hotel. Staff were excellent ( Especially Mickey - very attentive to our every need ) Can highly recommend this hotel, great food, great bar GREAT staff! 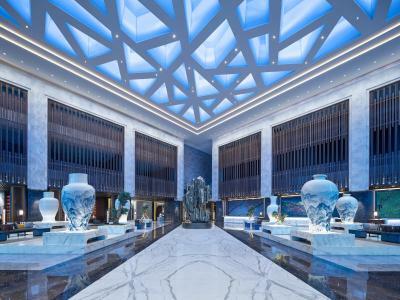 This is my favourite hotel in Beijing! We upgraded to a Club Room and did not regret it! The facilities were incredible - afternoon tea, evening drinks with nibbles and a continental breakfast. The room is outstanding and staff lovely. Can’t wait to go back! second time stay in in Nuo. The executive room is as excellent as last time. Nice room, great service in the lounge, excellent breakfast ... Really enjoyed our stay and will continue the choice next time!